Tewkesbury Abbey Schola Cantorum is the choir of men and boys which sings the weekday services of Choral Evensong in Tewkesbury Abbey under the direction of Simon Bell. Since 2006, the Choristers have been educated at Dean Close Preparatory School in nearby Cheltenham, which is a full member of the Choir Schools’ Association. The choir, formally known as the Abbey School Choir, was founded in 1973 by Miles Amherst. Beyond Tewkesbury, the choir can be heard broadcasting Choral Evensong on BBC Radio 3 and performs concerts both in the UK and overseas. In addition to an annual sell-out performance of Handel: Messiah in the Abbey in December, the choir enjoys regularly collaborations with professional orchestras, including the Bristol Ensemble and Corelli Orchestra. Recent concert tours have included performances in France (2017) and The Netherlands (2015). 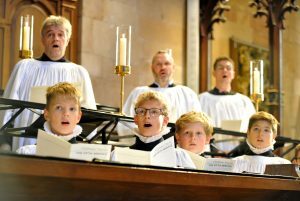 Tewkesbury Abbey Schola Cantorum records exclusively for the Regent label, and their most recent CD, Our Lady Queen of Peace, featuring a broad spectrum of repertoire for the Feast of the Assumption, was released in February 2018.